good thought, thanks Kerfe. I will definitely try this again, hopefully with better results. At Nina’s urging I just went to see Picasso’s sculptures at MOMA and then I wandered around the museum. All artists do drawings that aren’t “finished”…just ideas. If you’re famous they end up on the walls of famous museums, but that doesn’t make them either finished or necessarily great (although they might be great even though unfinished as well). You are way too hard on yourself in expecting perfection in every thing you do. Those Picasso sculptures are genius, but frankly, he churned out quite a bit of crap too. Lots and lots of it. He knew he could sell it so he didn’t edit himself. It’s all a process with plenty of dead ends. So just do it, comment on what you think and what you learned, but don’t be so judgmental. It’s all going in the right direction. This is what I was doing on Sunday prior to cutting that painting up – which I really did like the results of that. I think that revisiting this just brought back the really bad mood I was in while doing it. I think the accounting world is so different from art and I’m still going in sometimes the way I do with my “day job”, knowing that as long as I’m on task, I start with X and wind up with Z. Every single time, I know where I’m going and I just have to keep myself on task to get there. This is so different, and I’m still feeling my way. If I weren’t blogging daily, I’d have never put this on the internet. I was just….looking for something to post. Which makes me again come back & question daily blogging. I may come to a place where I blog less often, but whatever I post will be something I really want people to see. I appreciate your thoughts. I’ve learned a lot from you & Nina. I admire your ability to start with x and wind up with Z. My older daughter is excellent at that kind of process too, but not so good sometimes when it’s not a straight line. It’s hard for me, so I understand the difficulty of trying to switch gears. I like those circles though, and there’s no reason not to post things that are “in process”. On the other hand, I think we could all be more irregular in our posting and the world would still go on. It’s a motivation for me to finish things, but I often don’t go online much at all on the weekends. We are all learning from each other I think. No doubt, and it’s wonderful. And you mention the reason I continue: it’s a great motivation to churn out stuff, to aim higher and push myself to make something worth posting daily. How can I do it faster, how can I make it better? So those are all good things. Of course, there are not so good things too so it’s a balancing act and trying to find a place where more good than bad comes out of it. I may run into a place this year where I just don’t have the time to make something and blog too. And as you say, won’t be the end of the world! So it’s all good. Thanks for helpings sort this through! I’m always thinking about it myself. Hard to balance our wishes and our obligations. Splendid colours and a nice bit of collage. Certainly worth pursuing, I’d say. Thanks, Michael. It’s always fun to try new techniques and circles just call me these days. I’m glad you enjoyed it. I’m so glad you enjoyed this! Thank you so much for that info – will have to look him up! Its very soothing to look at! Lots of harmony here! Thanks, Cathe; so glad you like it! I’m really surprised (and encouraged) by the feedback on this one. Thanks as always for your visit. Make the image on this post bigger. There’s a lot going on and I’d like to explore the image a bit more. I’m not tech savvy, but I’ll try and figure that out. Thanks. Makes me want to fingerpaint. And this reminds me of something Jill would like to do! Kathy, the technique was originally demonstrated as a finger painting thing! So interesting you say this. It really was a lot of fun to do – I used my acrylic set from Wal-Mart that I started with at the very beginning of my art journey (8/2014)…..was like $6 and you can’t beat it. I think you might really enjoy this! And yes, Jill has been inspiring all my mixed media stuff lately. She is a force to be reckoned with, for sure! I’m so glad, thank you Jodi! (Another piece that I almost didn’t post – I’m always surprised by how those go) Glad it made you smile! Why is it so easy to see the beauty in others’ work?! And not our own? I love these types of things, but alas do not feel I can do. Oh so many things I want to try – so little time – must focus – haha! Amen. I just feel the need sometimes just to totally play and forget about trying to make something look like something. Like everything else tho, this kind of thing looks great on the YT videos, and not always so easy in real life. It wasn’t the circles part of this that was so hard, it was the layering and the depth and all that that I feel this lacked. but admittedly, I had very little time or imagination left by that point in the day. hehe. LMAO Charlie!!!! Oh, YOU are priceless, my friend!! I needed a laugh this morning!!! I am so glad you noticed just how bad this book was by the few words you quote here lol!! Thank you so much, you made my whole morning, sir! It really is, Laura, nothing beats it. So glad you liked it – I hope you try it! No need for expensive supplies, just craft paint is all you need. What a playful art piece. I feel like diving into some fun like this right now! Thanks for posting your cool,art Laura. I hope you do it, Sharon! It was fun and zen. Thanks for your kind encouragement. Always Laura, I love being on the encouragement team! Your circle designs gives this a lot of energy Laura – wonderful creativity. Aw, thanks Mary. Sometimes I need a break from all the realistic work and trying to get something to look like an image. MM work is equally challenging but in a whole different way and I need more color play now. Thanks for your visit & comment, friend. Thanks, Teri. I don’t have much in the way of acrylics but sometimes I think that helps. Thanks for your visit & comment! Great color and palette and neat abstract. Thanks, Deborah! Glad you enjoyed it. This is wonderful! I adore circles. I made so many I quit making them because I felt I needed to do something besides circles. 😀 Something soothing to the eye maybe. Maybe I should consult Freud. Lol I was thinking the same!! I could really fall into a circle thing for awhile! Does make you wonder. He he. LOL taking a page out of your book, Jill (no pun intended)! This still is “hard” for me in a way, but I’m learning lol. Did you see Charlie’s comment? I thought that was hilarious!! 😀 I’m glad you liked this! If you google Cat Hand painted circles YouTube you will find her video, if you’re interested! Love mixed media, and love your experimenting. Good one Laura! Thanks, Jennifer! I appreciate your visit & encouragement! I do enjoy visiting Laura! Have a fabulous day! Noted your comment on daily blogging – I’ve read posts on this which also question being creative every day as it can ‘dry up the well’ – but guess it does depend a lot on the person. In the same way as journalling can drain the creative impulse to write, I guess. Thanks, Nexi. I don’t know if I’m going through a midlife phase or what this is, but I can’t imagine a day without art. When time is tight though, it’s harder to do art and blog about it too. Now through mid-April is my busy time at work, and at the end of a busy day….sometimes the drawings are good and sometimes they’re not. If you’re not blogging daily, who cares? I never consider a drawing “bad” because they’re all practice. But it can be hard sometimes to find something worth posting. Think other bloggers are tolerant of people’s schedules & that the creative impulse comes and goes. Art takes a lot more effort than point and shoot photography, that’s for sure…! I’d say do what comes naturally – vary the routine if need be. Sometimes I go to ground for a while if life is hectic off blog. Thanks, Nexi. I’ve been thinking about it for awhile, need to think on it some more. I appreciate your thoughts. I find this design very appealing and interesting on several fronts. First the play & experiment aspect is fabulous. I like your repetition of circular forms. Upon closer look, I found the smaller stencils encircling the words eye, ies, and arti. 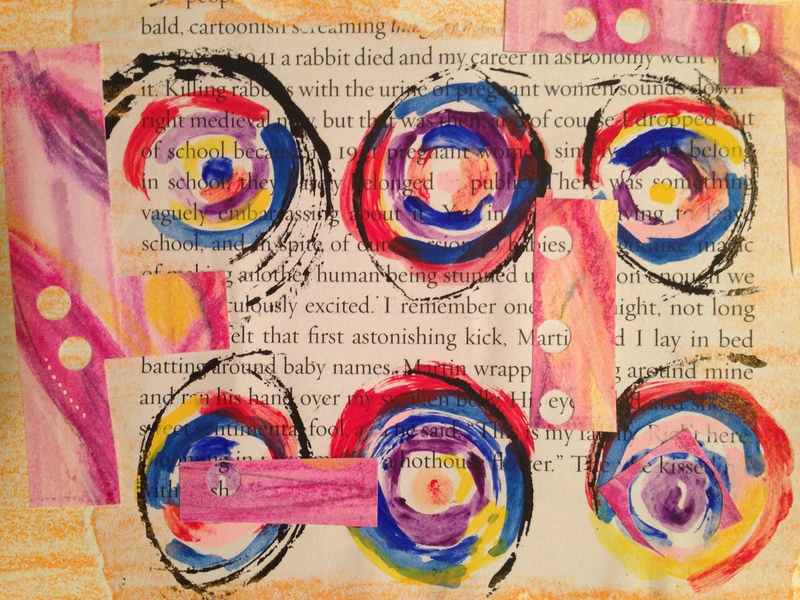 My mind scanned it as “Arti Eyes”… I also liked the wrapping around of colors, upon the circles. The text, the page you used was intriguing about the rabbit and the pregnancy. Odd details, to catch the Artist’s eye. I think, you could easily use this design over and over as a starting point for other images. you’re welcome miss Laura 🙂 I’m really not so patient in daily things I find these days… but with art, students, etc, I still have bucket loads of it. alot of empathy, I think. And we appreciate it very much! Thank you!